The American Mandarin Society hosts events regularly that provide you with a chance to practice your speaking skills through discussion of Chinese policy. You can find a list of upcoming events on our events page. The Washington Chinese Language Meetup Group has been meeting in DC since 2003 and has over 2000 members. Meetup groups are a great way to meet other students of Chinese and practice your speaking skills. Italki– Italki is a website to find language partners and practice your language skills. There are many Chinese native speakers on italki and many are willing to speak to you over Skype to help you practice your Chinese. An additional benefit is that you can search for informal or professional tutors to give you formal lessons. If you are willing to pay extra for tutoring, you can easily find a professional tutor to give you classes for under 10 dollars an hour. Proper pronunciation is one of the hardest aspects of Chinese to master. If you build up poor pronunciation habits as a beginner, they will stick with you even as an expert. The problem is that many Chinese teachers tell students that a specific sound should be pronounced like syllables in English words, like the pinyin “zh” should be pronounced like “dge” as in ridge. While this is a good way to introduce Chinese phonetics, it leads Americans to use English sounds to replicate Chinese syllables even though there are important differences. 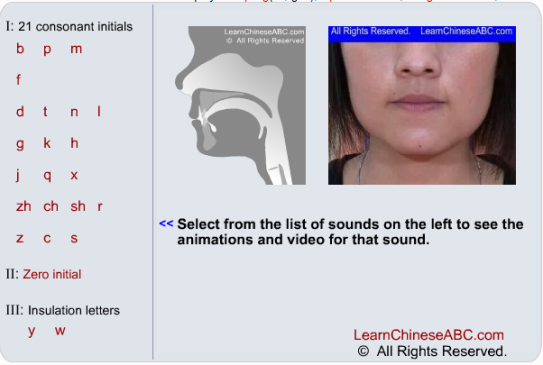 Learn Chinese ABC has a useful tool that provides audio and video descriptions of each initial and final sound in Chinese. The descriptions are much better than what you normally hear from Chinese textbooks/teachers and they describe clearly how the sound should be pronounced. Ex: Instead of just saying “zh” should be pronunced like “dge” in ridge, the website a clear diagram of proper tongue and mouth position and step-by-step explanation with tips like “the tongue tip loosely rolls up and presses against the front of the hard palate to create an obstruction in the midline of the hard palate.” The layout of the website is not the best, but it has plenty of information you won’t find in simple pronunciation guides. Most students encounter similar problems with tones as they do with pronunciation. Tones are introduced as a beginner as if they represent the exact tone of all Chinese words. Once students finally get a hand on tones, they end up sounding like robots. The problem is that tones are a guide to understand how to speak properly, but not the key. For example: The third tone is always taught as a falling-rising tone. It dips low and then rise back up quickly. However, in regular speech, the third tone is usually pronounced as a “low” tone rather than the exaggerated falling-rising tone most students are taught. Below are some sources that can help you move beyond the simple 4 tone diagram and work on sounding more like a native speaker with your tones. A good place to start is Sinosplice’s article on tones in natural speech here. Below are some useful resources for improving tones. 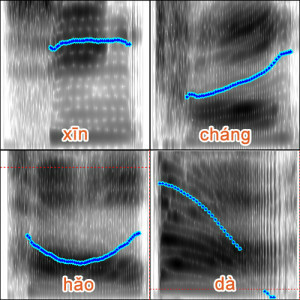 Praat– The language blog Sinosplice has a great page on the software Praat, an audio program that helps you see the pitch contours in your speech. You can play a native speaker’s voice and examine their tones, then repeat the sentence and examine your own. While this may not be the most useful tool to improve your tones, it can help you spot how the tones and stressed syllables should behave, while also allowing you analyze and compare your own speech to a native speaker. You can find Sinosplice’s article on Praat here and the actual software here. 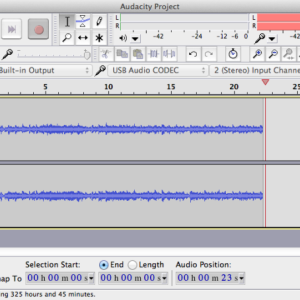 Audacity– Audacity is another program similar to Pratt that can be used to examine and record your speech. Audacity is good for examining stress patterns in speech and can help show you if you are emphasizing the correct words in a sentence. A good way to use audacity is to pick a sentence from the video and record the native speaker’s voice. Then, either record yourself mimicking the speaker’s voice or just reading aloud the characters yourself and compare the differences. You can use the comparison to see if you have problems in stressing the correct syllables.